Can you be more with less? I am not sure I can embrace the ideas put forth in this post, but I think there is much that should be considered. I never thought I would laugh at how busy I used to be. I was serious about my ability to be superwoman. I could work 40+ hours a week, raise a child, volunteer when anyone asked, exercise, travel, cook, and clean. I could do it all, and then some. Everyone was doing it all, so I did too. I didn’t want to do it all. Doing it all made me exhausted. Doing it all cost me friendships. Doing it all cost me my health. My busyness wasn’t even a little bit silly. Becoming less busy was not an accident, but a decision I made on purpose. I made the decision that a busy life wasn’t a life for me. Being a good person, loving wife, mother and friend…that was the life I wanted. Next to that, I wanted the freedom to do things that made my heart sing instead of things that weighed me down. Until I intentionally left a life of chronic busyness, I couldn’t see how silly it really was. The silliness of busyness is that sometimes you are so busy, you can’t recognize you are in trouble. You are so overwhelmed that you can’t figure out how to change. You are so used to being busy that you create more work to make your life even busier. If you are anything like me, you are busy because you want to be or because you don’t know how to be un-busy. You are busy out of misdirected guilt because you think if you do enough, you will be enough. When you decide that it is ok to live life your way, you can stop being busy and start doing things that matter. You can talk about your meaningful day instead of ranting about your busy schedule. Decide today that you are enough, even if you never do anything, accomplish anything or produce anything ever again. You are enough. While you may think that you are making sacrafices for others by being busy, you are likely sacraficing the same relationships you think you are saving. Get real, make time and consider what is most important to you. Then do that first. The rest can wait. Courtney Carver is the author of Simple Ways to Be More with Less. Read more from Courtney at her blog, Be More with Less, or follow her on twitter. This may seem like stream of consciousness…After a challenging year, as many of you have experienced, we made it to Thanksgiving, 2010. The economic situation has hit us and many changes have been made. Some have been practical and others have been subtle. In some respects I have become more solitary. 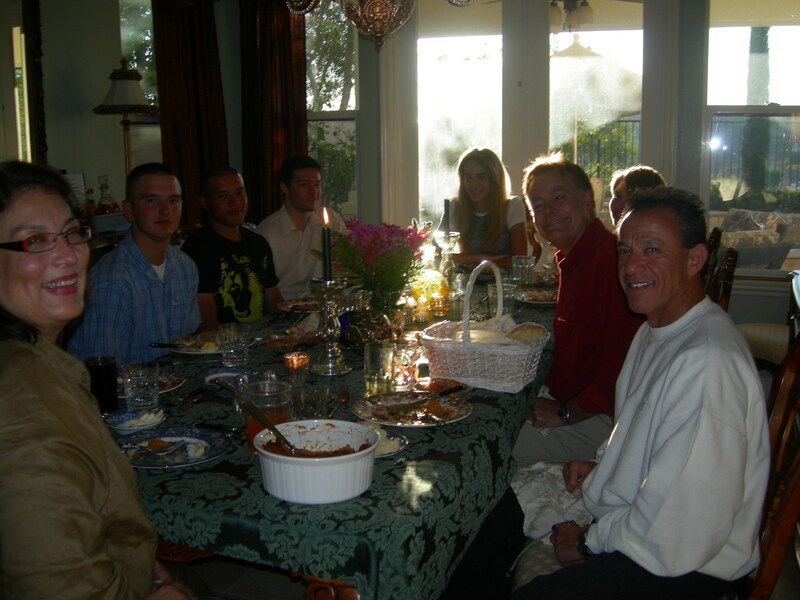 I am spending more time reading ( I belong to two book clubs), I am cooking more…Thanksgiving dinner was insane!!!. I am fine tuning the home, and spending more quality time with my daughter. Not so bad. On balance the practical changes have been sensible. Ultimately, I wondered why we did not make them earlier. So here I am. Grateful to have movement. I am joyously aware. Happy holidays to all. Looking forward to 2011. Recently, I received a summer book list from the Amherst Summer Great Books Program. There were many essays, poetry and books, I had not read or thought about in many years. I am passing this list to my 14 year old daughter. However, I reread an essay by Joan Didion and thought I would share it with you. I believe this is what self respect means. I have included the booklists mentioned. They are not only good for college bound students, but a thoughtful addition to your own or your bookclub’s reading list (see Book List tab on this site). Although to be driven back upon oneself is an uneasy affair at best, rather like trying to cross a border with borrowed credentials, it seems to me now the one condition necessary to the beginnings of real self-respect. Most of our platitudes notwithstanding, self-deception remains the most difficult deception. The tricks that work on others count for nothing in that well-lit back alley where one keeps assignations with oneself; no winning smiles will do here, no prettily drawn lists of good intentions. One shuffles flashily but in vain through ones’ marked cards, the kindness done for the wrong reason, the apparent triumph which involved no real effort, the seemingly heroic act into which one had been shamed. The dismal fact is that self-respect has nothing to do with the approval of others – who are, after all, deceived easily enough; has nothing to do with reputation, which, as Rhett Butler told Scarlett O’Hara, is something people with courage can do without. To do without self-respect, on the other hand, is to be an unwilling audience of one to an interminable documentary that deals with one’s failings, both real and imagined, with fresh footage spliced in for every screening. There’s the glass you broke in anger, there’s the hurt on X’s face; watch now, this next scene, the night Y came back from Houston, see how you muff this one. To live without self-respect is to lie awake some night, beyond the reach of warm milk, the Phenobarbital, and the sleeping hand on the coverlet, counting up the sins of commission and omission, the trusts betrayed, the promises subtly broken, the gifts irrevocably wasted through sloth or cowardice, or carelessness. However long we postpone it, we eventually lie down alone in that notoriously uncomfortable bed, the one we make ourselves. Whether or not we sleep in it depends, of course, on whether or not we respect ourselves. Like Jordan Baker, people with self-respect have the courage of their mistakes. They know the price of things. If they choose to commit adultery, they do not then go running, in an excess of bad conscience, to receive absolution from the wronged parties; nor do they complain unduly of the unfairness, the undeserved embarrassment, of being named co-respondent. In brief, people with self-respect exhibit a certain toughness, a kind of mortal nerve; they display what was once called character, a quality which, although approved in the abstract, sometimes loses ground to other, more instantly negotiable virtues. The measure of its slipping prestige is that one tends to think of it only in connection with homely children and United States senators who have been defeated, preferably in the primary, for reelection. Nonetheless, character – the willingness to accept responsibility for one’s own life – is the source from which self-respect springs. Self-respect is something that our grandparents, whether or not they had it, knew all about. They had it instilled in them, young, a certain discipline, the sense that one lives by doing things one does not particularly want to do, by putting fears and doubts to one side, by weighing immediate comforts against the possibility of larger, even intangible, comforts. It seemed to the nineteenth century admirable, but not remarkable, that Chinese Gordon put on a clean white suit and held Khartoum against the Mahdi; it did not seem unjust that the way to free land in California involved death and difficulty and dirt. In a diary kept during the winter of 1846, an emigrating twelve-year-old named Narcissa Cornwall noted coolly: “Father was busy reading and did not notice that the house was being filled with strange Indians until Mother spoke out about it.” Even lacking any clue as to what Mother said, one can scarcely fail to be impressed by the entire incident: the father reading, the Indians filing in, the mother choosing the words that would not alarm, the child duly recording the event and noting further that those particular Indians were not, “fortunately for us,” hostile. Indians were simply part of the donnee. That kind of self-respect is a discipline, a habit of mind that can never be faked but can be developed, trained, coaxed forth. It was once suggested to me that, as an antidote to crying, I put my head in a paper bag. As it happens, there is a sound physiological reason, something to do with oxygen, for doing exactly that, but the psychological effect alone is incalculable: it is difficult in the extreme to continue fancying oneself Cathy in Wuthering Heights with ones head in a Food Fair bag. There is a similar case for all the small disciplines, unimportant in themselves; imagine maintaining any kind of swoon, commiserative or carnal, in a cold shower. To have that sense of one’s intrinsic worth which constitutes self-respect is potentially to have everything: the ability to discriminate, to love and to remain indifferent. To lack it is to be locked within oneself, paradoxically incapable of either love or indifference. If we do not respect ourselves, we are on the one hand forced to despise those who have so few resources as to consort with us, so little perception as to remain blind to our fatal weaknesses. On the other hand, we are peculiarly in thrall to everyone we see, curiously determined to live out – since our self-image is untenable – their false notion of us. We flatter ourselves by thinking this compulsion to please others an attractive trait: a gist for imaginative empathy, evidence of our willingness to give. Of course I will play Francesca to your Paolo, Helen Keller to anyone’s Annie Sullivan; no expectation is too misplaced, no role too ludicrous. At the mercy of those we cannot but hold in contempt, we play roles doomed to failure before they are begun, each defeat generating fresh despair at the urgency of divining and meeting the next demand made upon us. It is the phenomenon sometimes called “alienation from self.” In its advanced stages, we no longer answer the telephone, because someone might want something; that we could say no without drowning in self-reproach is an idea alien to this game. Every encounter demands to much, the tears and the nerves, drains the will, and the specter of something as small as an unanswered letter arouses such disproportionate guilt that answering it becomes out of the question. To assign unanswered letters their proper weight, to free us from the expectations of others, to give us back to ourselves – there lies the great, the singular power of self-respect. Without it, one eventually discovers the final turn of the screw: one runs away to find oneself, and finds no one at home.